Two-year international warranty. Warranty . 【Gift available】His and Hers Wrist Watches, Couple Gift Set. Ideal gift for couples Valentine's Day, Wedding and Anniversary. 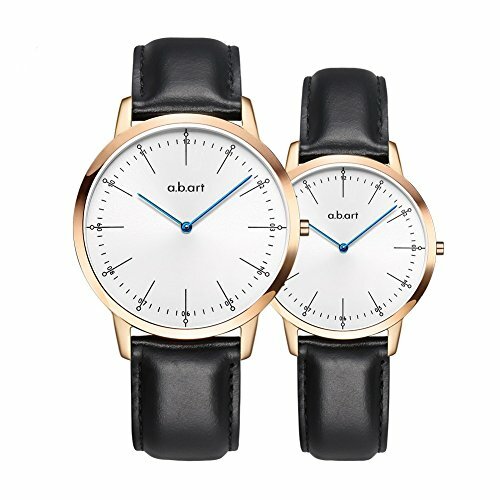 【a.b.art movement】Every a.b.art watch is a timepiece with high quality, and designed with Ronda Quartz Movement 1069 Swiss Parts. Sapphire crystal window makes a.b.art watch more durable and hard to resist scratch. 【Occasions】a.b.art watches fit various occasions. No matter business, casual, daily uses, or outdoor sports. It's also a best gift to your lover--family, friends, boyfriend or girlfriend. 【Notice】Water resistant to 30m (98ft): withstands raining and splashes of water, but no shower or diving.